4K Ultra HD video recording @ 30 fps. High definition video recording at 720p @ 240fps and 1080p @ 120fps. Burst mode support for still image capture of over 700 Megapixels per second. Multi-exposure High Dynamic Range (HDR) imaging support, including local tone mapping, preserves image details in high contrast scenes. Electronic Image Stabilization (EIS) with rolling shutter correction. 3D Motion-Compensated Temporal Filtering (MCTF) with de-ghosting for reduced artifacts and low light performance. Support for applications including wireless preview, playback, and upload of stills and videos to a smartphone or directly to the Internet over WiFi. Interfaces such as DDR3L, USB 2.0 host, HDMI, and SDXC SD card. Low power – <1W for 1080p60 encode, <2W for Ultra HD 4K encode. The A9 Camera Development Platform contains the necessary tools, software, hardware and documentation to develop a state-of-the-art network-enabled Ultra HD camera design. Did I hear someone say GoPro Hero HD4...?? So this is how future goes. @vitaliy_kiselev talked much about this. If mainboard is reduced, and x86 processor is used, then we can call it a dream machine. 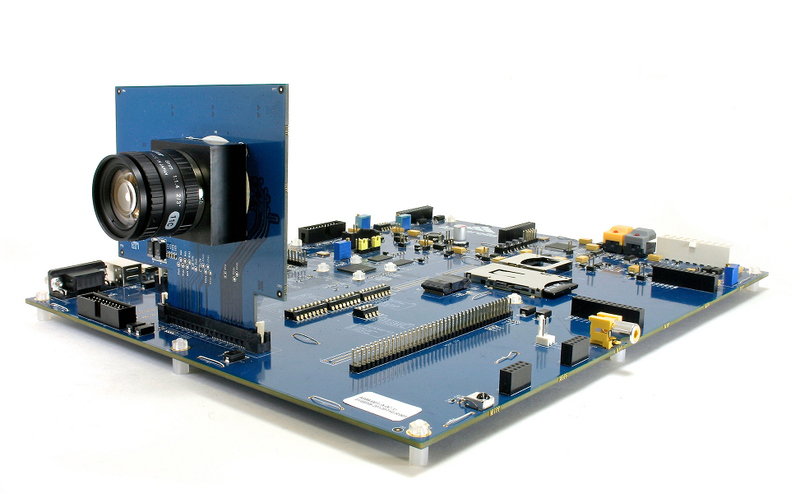 Imagine attaching PCI express PCB with full frame or 4/3 sensor. It would be like making your own computer lol. custom cases!! Just remember that it'll be new integrated chip, like AMD or Intel are working on (check latest Z Atoms). All in one. Probably four core. USB 3.0 (updated) controller. System on chip. I dream once made by others, finally we have tech for making it so. But i dont understad why use A9 when you can use A15. But i dont understad why use A9 when you can use A15. Because license cost real money. And A15 is more complex also. For this thing to be real raw camera you need good heatsink (otherwise it'll be constantly slowing down), four 2GHz A15 cores and small core to oversee things. Looks similar to Tegra (Nvidia Tegra 4 T43) :-) Also, of course, USB 3.0 integrated, and SATA. Add here 64 bit DDR3 memory bus. I dont think A15 complexity is an issue here, since manufacturing process is boss here. License costs are real issue!!!. Making it A15 core will bring better performance, but since this is a full system chip, that may be not an issue when adding extra layers of logic for decoding. This "camera'' wil have some good general performance if linux is applied to ti. Imaging more than a preview of footage on camera, maybe even grading...but not at 4k not with A9 single chip solution. Besides the obvious hardware specifications, I am pleased to see the openness and flexibility of the platform. As I understand, the Dual Core ARM Cortex-A9 CPUs should be enough for basic imaging data applications including data streaming. Fabricated in Samsung's 32nm HK-MG process, "the A9 offers very low power consumption, enabling 4K resolution video cameras with small form factors and extended battery life." Anandtech ( http://www.anandtech.com/show/6652/ambarella-announces-a9-camera-soc-successor-to-the-a7-in-gopro-hero-3-black ) has discussed the A9 and compared it with the previous generations of Ambarella's camera SoC, A7, that is used for the GoPro Hero 3 Black (the Hero 3 White and Silver have A5S SoC), built on Samsung's 45nm CMOS process. 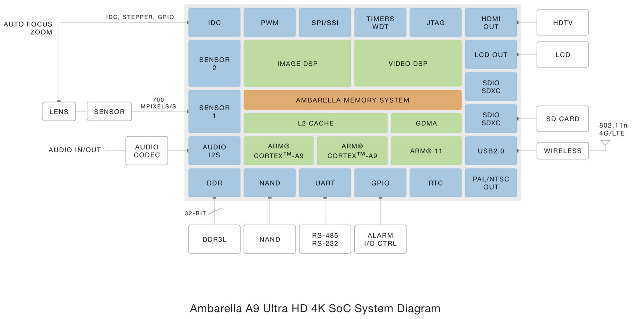 "The A9 SoC also includes two ARM Cortex A9s onboard at up to 1.0 GHz, up from the single ARM11 at 528 MHz from the previous generation. Ambarella claims under 1 watt of power consumption for encoding a 1080p60 video on the A9 and under 2 watts for 4K30 capture. The A9 also has built-in support for HDR video capture by combining two frames - thus 1080p120 becomes 1080p60 with HDR enabled. I got a chance to take a look at both HDR video capture on the A9 as well as 4K30 video encoded on a development board and decoded using the same board on a Sony 4K TV. I came away very impressed with the resulting video quality, clearly the age of 4K/UHD is upon us with the availability of inexpensive encoders like these that will make their way into small form factor cameras." No, cores are quite weak, they use build in custom chip parts to acceparate common image processing and compression/decompression parts. This they are really aiming at low consumption cameras. If we are talking about raw camera low consumption is not so important. It is interesting that chip Kineraw Mini will be using, most probably something like Z2760. I'll tell you a truth. There are engineering internal settings editors for various ambarella chips floating around on the net. This will be how gopro set theirs up for 4k. Various cameras have combination button access to internal configuration editor. If you use, you can hack many similar cameras, more than ever done here so far. If set to max and menu settings for shutter etc and manual control configuration, a big improvement. Another truth. Latest chips can pull raw off of the right sensor at high frame rate before compression. So 4kp60±. It would be interesting if such raw could be output to new ultra high speed sd card, Usb3 or hdmi uncompressed then to recorder black magic may make cheap one again. If not, circuit traces might yield data. If it could at least be made to output uncompressed clean live, that would be useful. Many older chipset cameras might be made to do fullhd or better uncompressed Still, like a pocket gh2. Hi, How is it possible to get a hold on this Development Board? Any suppliers that are easy to buy from? Thanks!